Aarhus, Denmark, 5 October 2015 - A riverside hotel in the heart of Berlin was the venue for Stibo Systems’ 2015 European Master Data Management Event 2015, and while this year’s conference covered many topics from the MDM world, the pervading theme was a simple one – change. Over two days on September 30 and October 1, over 300 people from 14 countries, four continents and a vast range of industrial sectors gathered to exchange ideas and hear talks on key topics within the MDM world, covering Product Information Management, Data Governance, Customer data, Big Data and much more. Yet this eclectic mix of customers, industry experts and inspiring keynote speakers drove home some uniform messages. In this current era of unprecedented change, the business costs of directly facing up to digital transformation are minor compared to the potential losses of not addressing them at all. Stibo Systems is based in Aarhus, Denmark and its STEP technology is a world leading MDM solution that provides a single and trustworthy source of operational information across multiple domains. By working closely with businesses, Stibo Systems help companies adapt rapidly to change. The real-world advantages of STEP revealed were as diverse as the businesses attending the event. An established retailer detailed its adaption to a retail environment where websites, online shopping, smartphones and stores all play a part. Speakers from another high-street store explained the value of an MDM solution during a major website replatforming. An international tool manufacturer spoke of the importance of implementing a “manage once - use in many” data policy at the start of its ambitious multi-domain program while a global leader in its manufacturing sector stressed the value of relevant, complete and high quality data in generating sales. Another key theme was understanding that cultural change is just as important as technical innovation. Creating engaging personal experiences for customers requires employees to embrace change, understand the reasons for doing things differently and appreciate the important role they all play in giving a seamless, consistent service, regardless of the channel. World-class businesses are embracing digital transformation and Stibo Systems’ STEP technology can provide them with a complete, accurate and real-time view of data across an entire organisation. But as this year’s event in Berlin proved, it’s the people who are the true asset, adapting nimbly and effectively to challenges in this time of change. As the closing keynote speech from Stefan Hyttfors pointed out, from here on in, change will never be this slow again. 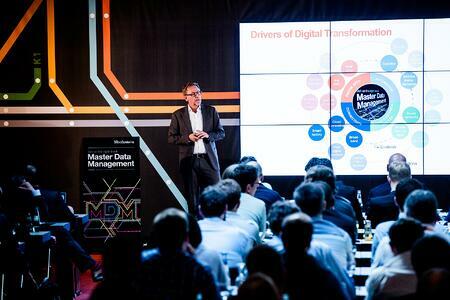 Stibo Systems’ Master Data Management Event was held in the Melia Berlin hotel on September 30 - October 1 in association with sponsors: CGI, Entity, foryouandyourcustomers, Javelin Group Satzmedia, and SHS Viveon.